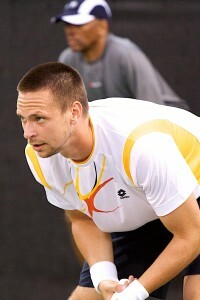 Last year in Doha, Nikolay Davydenko upended Roger Federer in the semifinals of the Qatar Open. Then, the Russian stunned Rafael Nadal in the final to claim the title. This time around, while Nadal fell victim in the semifinals to Davydenko, Federer exacted revenge. The world number two cruised to a 6-3,6-4 victory over the defending champion to pocket his third trophy at this tournament. Following a prompt hold, Federer provoked four consecutive miscues from Davydenko to break at love. With Federer flubbing an easy backhand to go down 15-30, Davydenko had a chance to get back on serve. However, Federer produced two forehand winners for game point and consolidated for 3-0. Moving forward, Federer coasted on his service game. Serving at 2-5, Davydenko fought off six break points before carrying the game. With Davydenko’s pass sailing long, Federer arrived at set point for the first occasion on his serve and capitalized with a forehand winner. In his initial two service games of the second set, Davydenko held with ease. Then, serving at 2 all, Federer connected on a backhand crosscourt winner and a sublime forehand volley winner to put the Russian in a love-30 hole. Fortunately, Davydenko encountered his first serve to maintain a 3-2 lead. Still, the Russian’s problem continued to be his inability to dent Federer’s serve. Serving at 4 all, Davydenko made a mistake with his backhand while Federer struck a backhand down the line winner on the next stroke. As Davydenko double faulted, Federer had triple break point. 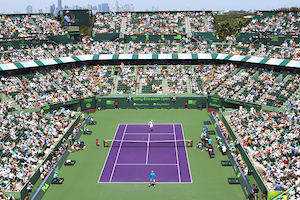 When Davydenko’s forehand traveled long, Federer secured the break and a 5-4 advantage. Quickly with a love game, Federer finished off his adversary and took the championship. The U.S. Open draw has been unveiled with the usual suspects at the top pack. Rafael Nadal and Roger Federer are the highest seeds followed respectively by Novak Djokovic and Andy Murray. For some, the path has multiple green lights, but for others it is lined with yellow flags. Here’s a breakdown of the draw. After his victories at the French Open and Wimbledon, Nadal is once more in pursuit of the U.S. Open trophy, the sole major he lacks. In 2008, the Spaniard was halted in the semifinals by Murray and last year in the same round by Juan Martin Del Potro, the champion. Although Nadal has been the most prolific performer on grass and clay this season, hardcourt has been a different story. Nadal has a lone final appearance in January in Doha and went down to Nikolay Davydenko. With neither injury nor fatigue an issue this time, Nadal is capable of going the distance. However, there may be a significant boulder in his way in the quarterfinals. Finally in shape after hip surgery, David Nalbandian has made himself part of the conversation and could clash with Nadal in the quarterfinals. Although Nadal recorded the win at their last meeting at the Sony Ericsson Open in March, Nalbandian’s form has improved markedly since then. Moreover, Nalbandian took the title as a wildcard at the Legg Mason Tennis Classic earlier this month. As a result, the Argentine will not be an easy customer for the Spaniard. While Fernando Verdasco, the eight seed, is technically another likely quarterfinal counterpart for Nadal, Verdasco is at best a minute obstacle. With a 10-0 record against his countryman, in a five set match, Nadal is a sure bet. De novo, Nadal has been placed on a collision course with Murray to reach his first U.S. Open final. Twice on hardcourt this year, Murray has comprehensively beaten Nadal including the Rogers Cup two weeks ago. After dreadful results most of the season, Murray is at last in form and defended his title in Toronto. If they clash in the semifinals, Nadal will have a tough time getting a pass.